We’ve done a lot of work with WordPress in recent years. One thing we’ve noticed is that very few site owners are anywhere near as obsessive as we are about keeping their sites up to date. Why is updating important? WordPress has become VERY popular – around 1/4 of ALL websites are run on WordPress! The good news is that there’s a huge amount of development and support. The bad news is that hackers find it easy to attack sites which are not kept up to date. 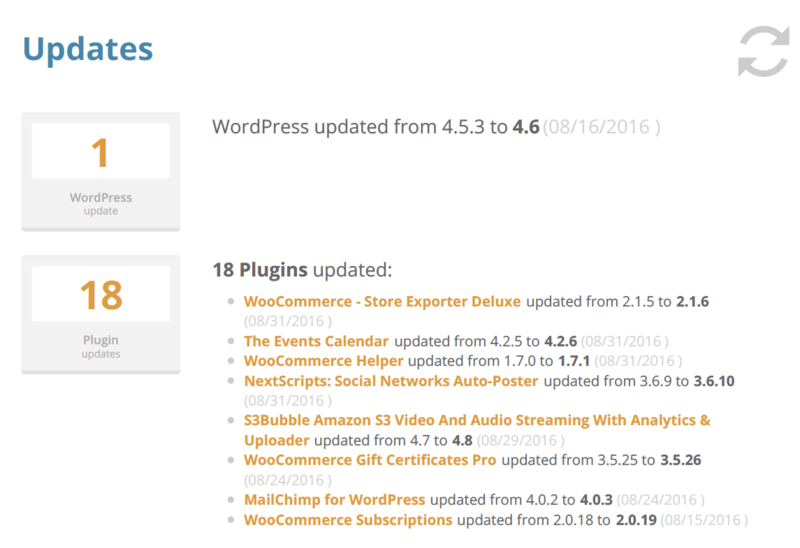 A good number of update releases for WordPress and its plugins and themes include security fixes. Hackers know that, actively share notes on exploits, and seek out sites which are still vulnerable. If you’re not keeping up, you’re falling behind! This is where we come in. We will monitor your site and run the updates for you*, typically within 48 hrs of release – and often much sooner than that! The above image is an excerpt from a monthly update report for one of our clients. It’s not uncommon for a single plugin to be updated several times in a given month – we’ve even seen multiple fixes released in the same day in some cases! And the typical site not only has 10 or 20 (or more) plugins, but usually several themes as well. We don’t expect that the average site owner would exhibit the level of obsession that is required to stay on top of keeping everything up to date. Do you really want to update 19 times a month? We also run monthly backups of both your database and your files to our cloud storage account. Just in case everything goes down the tubes, you’ll want to be able to rebuild everything to a known-good state quickly. That’s right, just $7.00 a month for peace of mind. More frequent backups (weekly, daily, even every 6 hrs) or regular uploads to your dedicated Google Drive, Dropbox, AmazonS3, or OneDrive account for as little as just $36.00/year. Keeping your software up to date is not an absolute guarantee that you won’t be hacked, but it is strong insurance, and combined with regular backups can be the difference between a large headache and a large de-hacking cost, and an easy, inexpensive fix. 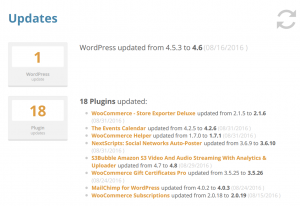 *Updates of WordPress core software and free plugins and themes from the WordPress.org repository (and many paid plugins and themes as well). License management of paid themes and plugins is available for additional cost dependent on the number of plugins/themes, and the complexity and frequency of released updates.